I took a long walk in our woods today. warm enough so you can still enjoy the walk. I went back to check on his leaf mold bins. You can read our original Leaf Mold post here. It snowed again last night and I enjoy taking photos of the snow. Here is a pic of his three teired leaf mold bin set-up. up one of our potential house site areas. 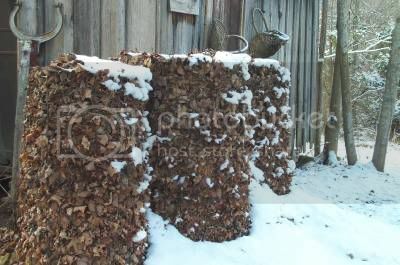 How to start your own leaf mold compost pile. You can go here and read all about it. Warm Winter Wishes from our Home to Yours.